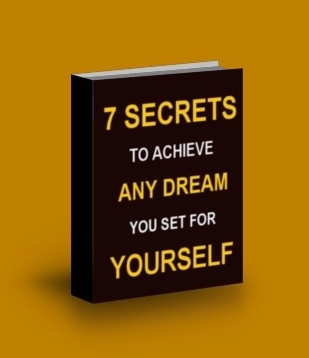 I’m delighted to announce that I’ve just created a brand new E-Course, 7 Secrets To Achieve Any Dream You Set For Yourself. In this course, I share powerful strategies to guide you to fulfill dreams that you might be thinking will never be achievable. The course is delivered via email. After you gain access to the course, you receive a Secret a day for seven consecutive days, and each Secret contains approximately 1,000 words of text. While I will in all likelihood soon be charging $47 or more for this course, or combine it with some other offering, for now I’ll be giving the course away free to people who express interest in the course by providing me with their name and email address through advertisements on Facebook. Since you might not notice upcoming advertisements about this course on Facebook, and you might be keen to gain access to this course now, I’ve made it possible for a limited time for you to gain access to this course in a different way. To discover how to gain access to this course now, click here. If you have a BIG dream you believe you can achieve, but for one reason or another haven’t yet been able to pursue or achieve it, be on the lookout for advertisements about this course on Facebook in the weeks ahead. Alternatively, if you know you want to see it now, click here.